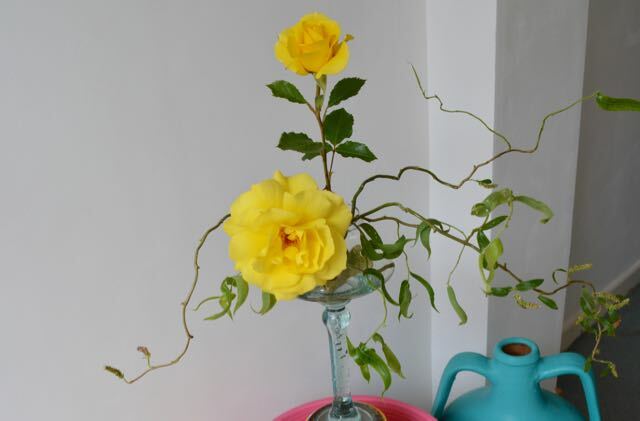 This rose, Floribunda Korresia, was given to me as a thank-you present this week, isn’t that lovely! I don’t know where to plant it yet but thought I would celebrate the gift by using two blooms in my ‘Vase on Monday’. 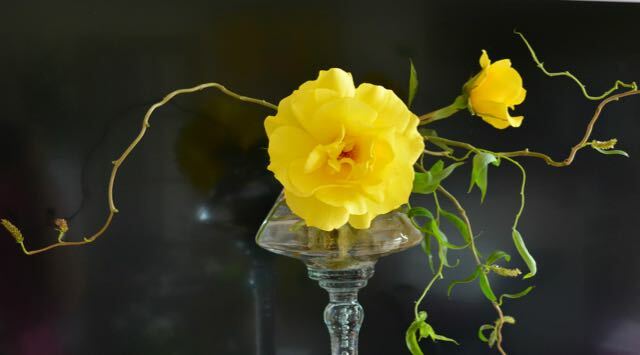 Just these two blooms fill the room with a glorious scent. The vase is a glass nightlight holder, which is great on a table outside as the shape protects the flame from the breeze. To keep the blooms and twigs of twisty willow in place I used some pebbles with holes in them, and threaded the stalks through the holes – clever huh! Where did that thought come from! How and where to photograph the vases is always a challenge for me – very few places with clear backgrounds. 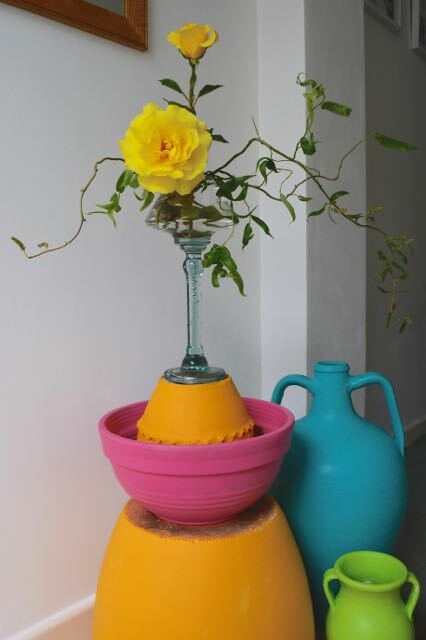 I have been decorating in the house this week and the terracotta pots the vase is standing on, were first painted with a watered down coat of white paint and then a couple of coats of left-over household emulsion paint. Except the urn which is painted with some left over Eggshell paint. Ooooo! I love those colours. The pots will go outside against the north facing wall of my garage that is being painted white. The ones covered with the vinyl emulsion last about two years before needing another coat to freshen them up. The turquoise Eggshell on the urn has lasted 4 years and still does not need a retouch. Still looking for the right background for the vase, I took this photo in front of the TV screen, what do you think? The contorted willow was grown from a little sprig that had sprouted roots in a vase about 6 years ago – it is now a magnificent tree, about 30′ tall, arching beautifully over my drive-way. So looking forward to seeing all the other Vases over on Rambling in the Garden. Pop on over and take a look, there are bound to be some gems!